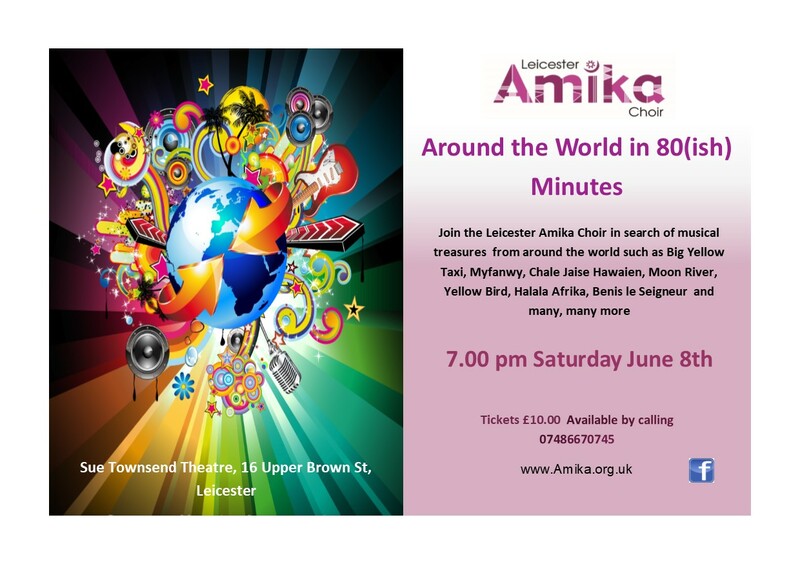 The award winning Leicester AMIKA Choir is a friendly diverse community choir which will go out of its way to make you welcome. We sing songs in many different languages such as Yoruba, Hindi, Swahili and Italian for example. Our learning is done by ear, so you don't need to read music and we have teaching tracks with songs in various parts so that choir members can listen and learn at home in between meetings and in preparation for performances. We sing in four parts usually: soprano, alto, tenor and bass. It's Ok if you don't know which you are - come along and find out! There are opportunities for choir members to learn solos as part of our repertoire, although there's no pressure on you to do this. There is no audition required to join our choir and all new members will be made to feel very much at home and welcome. Saturday July 6th Soar Valley Music Centre - LE4 7QG - last rehearsal of the season. There are opportunities for choir members to learn solos as part of our repertoire, although there's no pressure on you to do this. The choir are also available for hire for full concerts, garden parties, Galas, weddings and funerals subject to the choirs availability. New members are always welcome, for more information come along and see us which you can arrange by clicking on the 'join us' link at the top of the page.